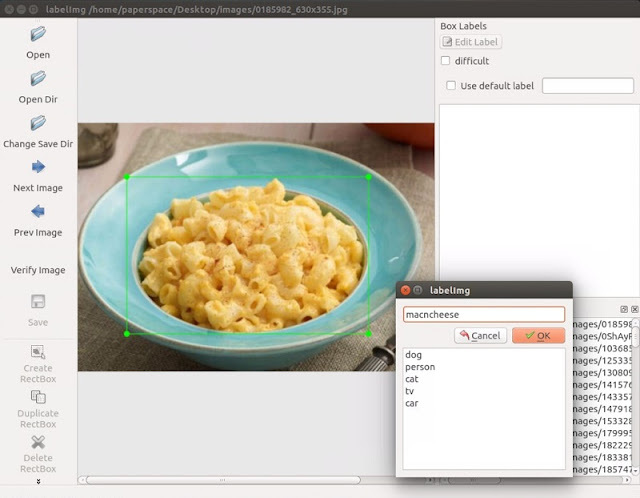 As in the previous article (Install tensorflow and object detection sample), we learned how to use tensorflow in object recognition with built-in data. But in practice we do not need too much data object train (need more machine resources, slow program speed). In this article we will learn how to train optional objects. This tutorial we will train the object on Ubuntu OS (linux). Annotate / label the images, ideally with a program. In this tutorial we use LabelImg. This process basically draws the cells around your object (s) in an image. The auto-tagging program creates an XML file describing the objects in the image. When running this file, you will get a GUI window. From here, choose to open the folder and select the folder where you saved all your images. Now, you can start the annotation with the rectbox creation button. Draw your canvas, add a name, and hit ok. Save, hit the next photo, and repeat! You can press the w key to draw the frame and use ctrl + s to make it faster. Once you have more than 100 images labeled, we'll split them into training and experiment groups. To do this, simply copy about 10% of your image and XML annotation files to a new folder called "test" and then copy the remaining files to a new directory called. is "train"
Once you have done all of this, you are ready to go to the next tutorial, here we will show you how to create the TFRecord files required from this data. Now go to generate_tfrecord.py. The only modification you need to do here is in class class_text_to_int. You need to change this to your specific class. In our case, we have only one class. If you have multiple classes, you will need to continue to build the if statement. And of course to do the train, we need to install Tensorflow. Then try to execute the protoc command again (make sure you are running from the models directory). We start to run generate_tfrecord.py script. We need to run two times, one to train TFRecord and the other to test TFRecord. Now, in your data directory, you have got train.record and test.record. Next, we need to set up a configuration file and then train a new model or start from a test point with a pre-trained model, which is what we'll cover in the tutorial. next post.